Yeah, but: Is it the thought that counts? The Long Version: Coca-Cola, the American brand that dominates the soft-drink market of almost the entire world, loves to support the home team no matter where it is. To celebrate the 2010 Olympics, they issued a small number of gold cans. There wasn't much promotion that I saw, no ads or special markings on the cases, and I haven't seen them in the stores. 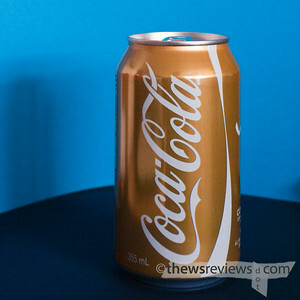 The distinctive gold colour of these cans surprised everyone who saw them: "How old is that thing?" being the overwhelming response. They look like they've faded from been left in the sun too long. 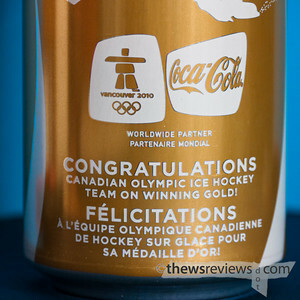 The fine print on the cans reads "Congratulations Canadian Olympic Ice Hockey Team on Winning Gold!" It's a nice sentiment, so I know this will sound churlish, but my question is: Which one? As usually happens, both the Canadian hockey teams - Men's and Women's - won gold medals. So either they've missed the pluralization, or they missed an entire event. I hope it's just a grammatical issue, because otherwise someone's been snubbed, and I doubt it's the NHL players. For what it's worth, 'Team Canada' also took twelve non-hockey gold medals, and I really don't think that team sports like hockey should be part of the Olympics in the first place. So perhaps I'm just snippy at a multi-billion-dollar corporation congratulating a select group of millionaires while neglecting the rest. Call it youngest-child syndrome. Even though these cans are listed on eBay for almost two dollars each, mine are gone and I have no regrets.